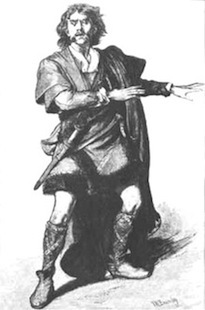 At the beginning of the play, Macbeth is described as a brave man, but his wife manipulates him by accusing him of being a coward, and throughout the play he struggles with his fears. Macbeth's Relationship with Lady Macbeth. At first, it appears that Lady Macbeth is the dominant partner, but after the murder of King Duncan she loses her grip on her husband. Macbeth tries to master fate, which only helps it to master him. Of Macbeth it might be said that "clothes make the man." There are quite a few metaphors which compare Macbeth's state of mind to that of someone wearing strange or ill-fitting clothes. Also, in the course of the play we first see him in his armor, then in regal robes, and finally in his armor again.